Become Memorable: Present in Threes. Choose three main points, no matter how long your presenting slot is. If you’re there to talk about a weighty subject, break each of your key three issues into three sub-parts. Your audience will be able to follow so much more easily. Why three? Well, a certain magic hangs in the aura around that number. There seems to be no rational explanation why: it’s just out there in so many ways that we simply cannot ignore it. There. That was in threes. It’s just more persuasive, isn’t it? And here are a few more examples. Ready, steady, go! ‘Lights. Camera. Action! Veni, vidi, vici. Three Blind Mice. The Three Musketeers. The Three Stooges. “Three things cannot be long hidden: the sun, the moon, and the truth.” Buddha. “I’ll try anything once, twice if I like it, three times to make sure.” Mae West. “There are three kinds of lies: lies, damned lies, and statistics.” Benjamin Disraeli. So how do we apply this to presentation? Simple. Never put more than three pieces of information in front of your audience at any one time. Hard to believe your heavily detailed work can be expressed so simply. Yet breaking down your presentation into parts of three is a highly effective method of ensuring your audience understands and remembers the message. It also helps you with structuring your story. It is absolutely guaranteed that if you stick to the power of three, your presentations will be more memorable, more actionable and more appreciated. 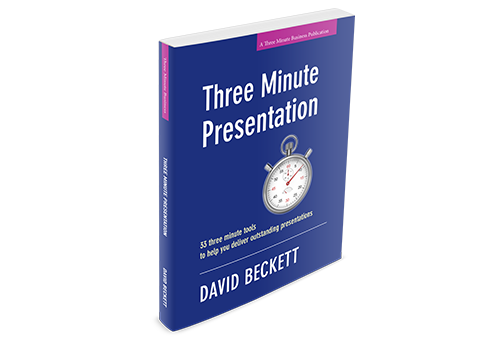 This article is adapted from a chapter of the book ‘Three Minute Presentation’ by David Beckett. Find out more here.